Surgeon Frederik Pauwels says farewell to Uraeus on his discharge from the equine hospital. Massey University in New Zealand reported May 23, 2007, that Uraeus, the horse who played Aragorn’s mount “Brego” in The Lord of the Rings, suffered a severe episode of colic. 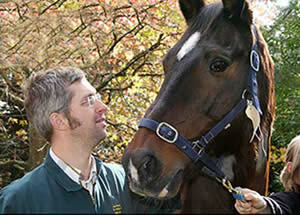 He was rushed to the University?s Equine Hospital, and was in surgery within 40 minutes. After a week of recovery, the 22-year-old stallion returned to his home on the Kapiti Coast, where he lives with veterinarian Ray Lenaghan and his wife, horse trainer Jane Abbott, both of whom worked on the films. Uraeus is doing well, and will be kept stabled for about another month, Lenaghan says, to allow the wound to heal. Uraeus shares the barn with other former equine cast members including Florian (Asfaloth), Kenny (Hasufel), Gandalf’s cart pony Clydee, several black rider mounts, and horses of Rohan. Mortensen emailed the Lenaghans to say that he was very grateful everyone acted so quickly to help save the horse and was looking forward to seeing Uraeus again this year after completing a project in Hungary (Good). 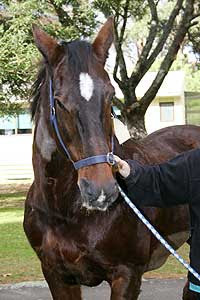 For details, see Lord of the Rings star saved by surgery and Lord of the Rings star bounces back from colic.